In 2015, the Federal Motor Carrier Safety Administration (FMCSA) reported that 415,000 crashes involving a commercial vehicle occurred that year alone and that in those accidents, as many as 3,852 people tragically lost their lives. These statistics are not only alarming, but reveal that being involved in an accident with a commercial truck is a very real, and deadly possibility. If you were injured in a collision with a semi-truck or another commercial vehicle, please contact an experienced truck accident attorney to learn more about your legal options. Where/When do Most Truck Crashes Occur? Although it might be a surprise to most drivers, around 60 percent of all commercial truck-related accidents don’t occur on busy highways, but on rural roads. In fact, only 25 percent of accidents even occurred on a highway at all, whether urban or rural. Most crashes occur at night or in the early morning hours. For instance, it is estimated that 35 percent of all fatal truck crashes took place between the hours of 6:00 p.m. and 6:00 a.m. Violation of a traffic law, which contributed to around nine percent of accidents. Driver distraction and inattention have proven to be especially deadly, as resulting accidents tend to occur at high speeds, which is extremely dangerous when an 80,000 pound truck carrying potentially hazardous cargo is involved. Texting in particular contributes to an alarming number of accidents, which is not surprising when you consider the fact that on average, commercial drivers who text take their eyes off of the road for as long as five seconds, during which time the vehicle could travel 100 yards. 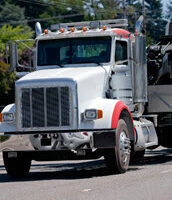 If you were injured in a truck accident, you may be eligible for compensation. Please call Boone & Davis at 954-566-9919 to learn more from an experienced Fort Lauderdale truck accident attorney who will evaluate your case free of charge.